Mobile Users: Click three line icon in upper left corner to open menu. ﻿﻿Dedicated to giving personal service in all that we do—service, sales & custom builds—Gibbs Custom Gunsmithing offers excellence at great prices. Stop in & see for yourself! TO ATTEND THE ILLINOIS GUN OWNERS LOBBY DAY (IGOLD) IN SPRINGFIELD. Come Out & Make Your Voice Heard! *Not the actual bus, and we don't know these people. ROAD TRIP! Neighbors, time to stand up and be counted. Tired of being punished for the lawless acts of others? If Illinois gun owners make this the largest iGold ever, it will send a clear message to those who curtail our rights in a misguided attempt to stop criminals. Wed, March 27th in Springfield. Ok, we're kinda proud of ourselves on these. 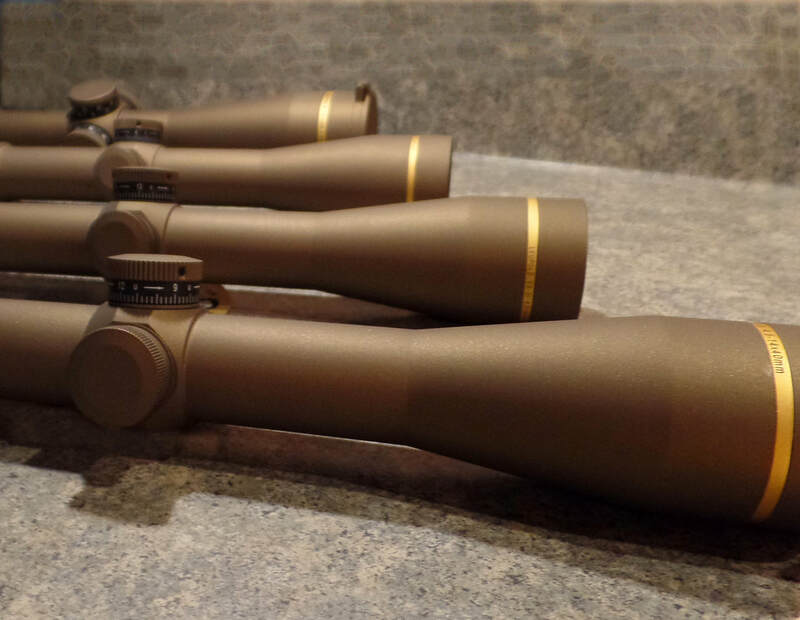 We've developed a process to Cerakote scopes with the heat-cured H Series formula, even high end ones like the Leupold VX-6HD with Firedot in the back here. This batch just left for a large Michigan retailer, who is making Browning XBolt Pro packages as seen at SHOT Show 2017. More info and photos.